Por Gale Crosley*, traduzido e adaptado por Roberto Dias Duarte. 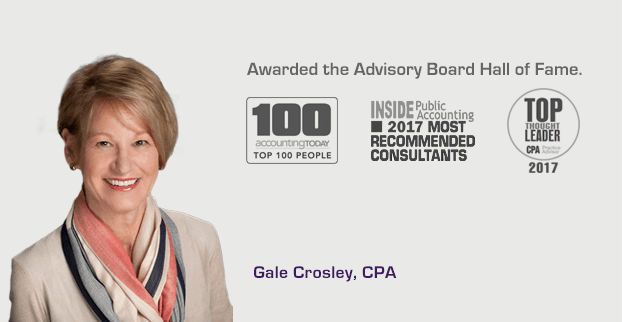 *Gale Crosley, CPA, consults with accounting firms on revenue growth. She was awarded the Advisory Board Hall of Fame. She has been selected one of the Most Recommended Consultants in the Inside Public Accounting “Best of the Best” Annual Survey of Firms for 13 consecutive years, and one of the Top 100 Most Influential People in Accounting by Accounting Today for 11 consecutive years. Gale is an honors accounting graduate of the University of Akron, Ohio, winner of the Simonetti Distinguished Business Alumni Award, and is an Editorial Advisor for the Journal of Accountancy. She can be reached at gcrosley@crosleycompany.com.